Luke McCullough made his Tranmere debut against Mansfield on Tuesday night. Grant McCann has admitted that Northern Ireland international Luke McCullough does not fit into his way of playing. The 24-year-old defensive midfielder joined League Two new boys Tranmere Rovers on loan until January earlier this week. McCann wants his bank of midfielders in his preferred 4-3-3 formation to rotate and get about the pitch - but sees McCullough as a holder. “I just felt he didn’t fit the way we play,” said McCann. “I love Luke. He’s a great lad. “There were a lot of clubs wanting to take him and he said he wanted to go to Tranmere. “It was really a case of wanting the three [midfield players] moving and rotating. “I think you’ve seen over the four or five games that we’ve played that Ben [Whiteman] doesn’t sit in a number four position, he moves around the pitch. They all take positions off each other. “I feel Luke is more of a defensive midfield player who just doesn’t move out of his slot, an Anthony Grant-type if you like. “Of course, there are games you might need one of them. “But the way we’re playing at the minute I want the movement and the rotation, and Luke didn’t fit that. 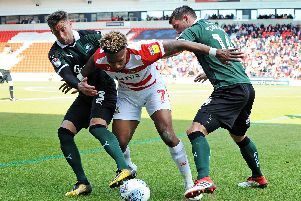 McCullough has made 112 appearances for Rovers since joining in 2013. Serious knee injuries have limited him to just 21 appearances during the last two seasons. McCann expects to add one new face to his squad before Saturday’s home clash with pacesetters Portsmouth but when speaking after Tuesday night’s goalless draw with Shrewsbury Town refused to divulge his identity or position.